Chapter 1 contains a brief introduction of the Study area. This is followed by the objectives and scopes of the Study. Chapter 2 describes the background of the Study area, Kampung Tersusun. This chapter includes the site observation and the review of existing data in the Study area. Historical hydrological data, meteorological data, drainage problem identification and proposed preliminary drainage improvement works for the Study area are discussed in this chapter. 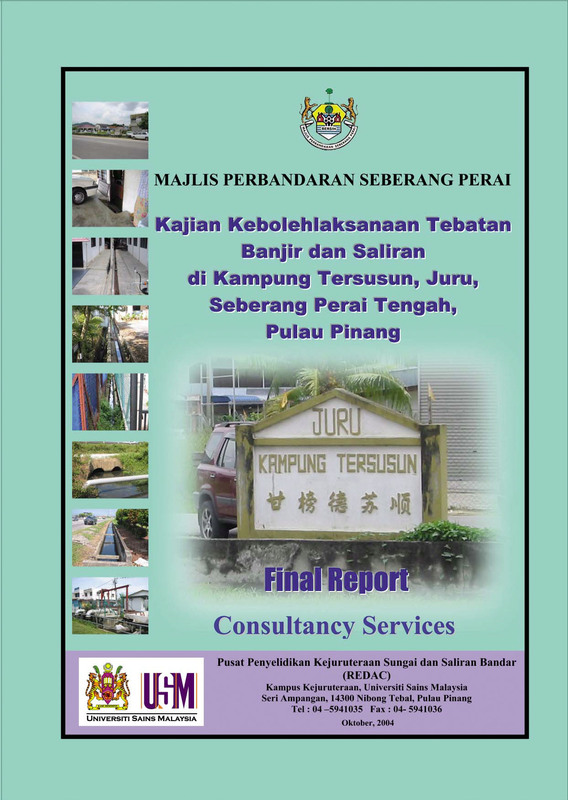 Chapter 3 gives the design criteria, which will be adopted for urban drainage design. Chapter 4 describes the existing drains condition in the Study area. Layout and details of existing drains in the Study area which are determined through internal drainage inventory are included in this chapter. Besides that, flood level determination and flood damage potential are also highlighted in this chapter. Chapter 5 consists of engineering design outline. Three proposed flood mitigation alternatives are presented in this chapter with two main components namely construction of pumping system and drainage upgrading. Chapter 6 delineates the project scheduling and costing for the all proposed flood mitigation alternatives. This is followed by a list of references where the data is sourced and information is referred during the Study. Appendix A gives the latter of acceptance and terms of reference Appendix B contains runoff estimation of the Study area and the existing drain capacity calculation sheets. Appendix C consists of flood depth calculation sheets for the Study area. This is followed by Appendix D, which the design discharge calculation sheets for major and minor storm event of three (3) proposed flood mitigation alternatives are attached. Appendix E contains the design calculation sheets of pumping systems for all the proposed alternatives. Cost estimation calculation sheets for three (3) proposed flood mitigation alternatives are given in Appendix F.